ILT are initials for Independent Learning Time. At some point in our class you will have some extra time, usually because you finished an activity early after doing your best on it. 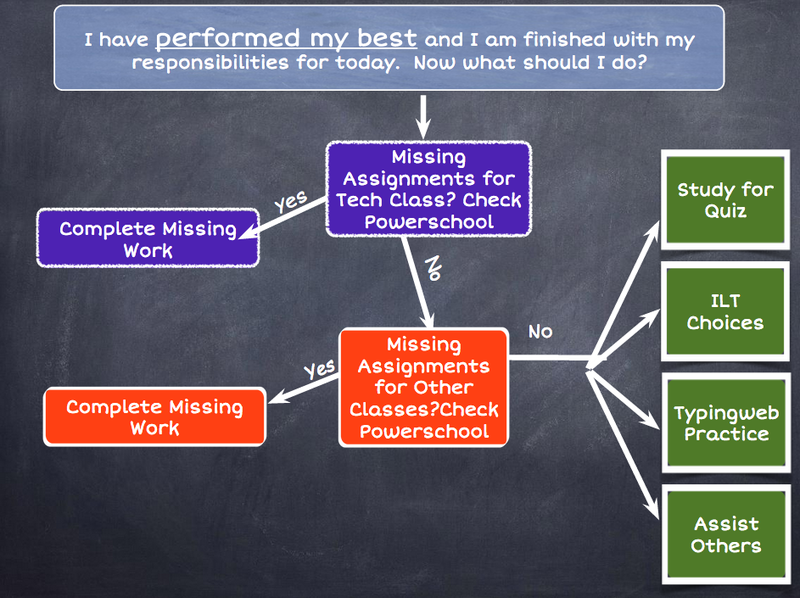 Or, you may be in Lab 16 for Advisory and you need something to work on as you are all caught up with your classwork. This extra time is what we consider ILT. The complete ILT policy is listed below, called ILT Procedures Descriptions. There are a few things that we need to highlight. 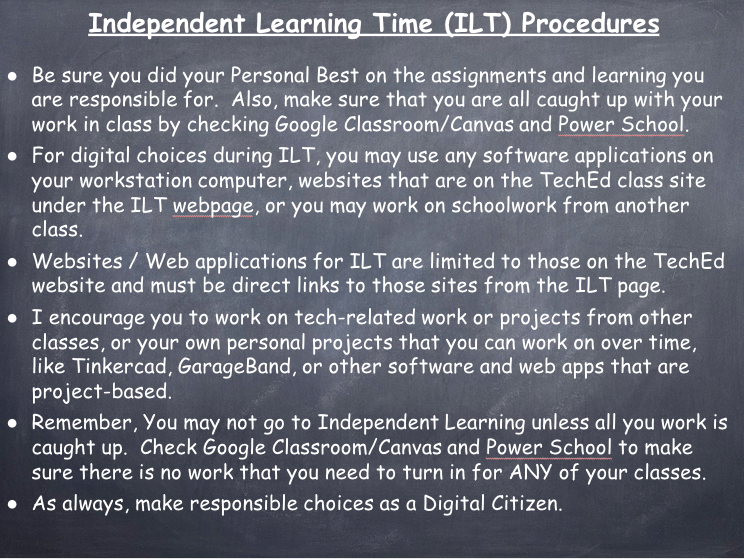 First, ILT is NOT free time - you are only allowed to go to the choices that are outlined below. If you are choosing to spend ILT online, you may ONLY pick from the choices that are available from the ILT Online Choices in the various categories listed below. Be sure to read each choice carefully. Some sites are labeled with "LS" at the end of it. That means that the link is "specific", which tells us that we may only go to pages that are directly part of that resource, not wandering off to advertising links or links to other web sites. When I am Done with My EdTech Classwork . . . Remember, if there is a "ls" at the end of the site name, that means it is link specific and you are not to click on other links to other webpages. Khan Academy - Really the best place to start if you want to learn about an academic topic on your own. ​Ted Ed - Awesome resource for learning about innovative topics in a new way. This independent learning option give you the opportunity to take your programming experience to the next level. Both CodeAcademy and SoloLearn allow learners to experience different programming languages of their choosing. If you are interested in this option, take some time to explore the resources above. Each service offers some different programming languages, and each web resource is a little different in their style of presentation. Think about what option is right for you. Not sure what programming language to choose? Be sure to read the short descriptions about each language to see what it is used for and what might interest you. ​​The list below features software applications that are installed on your computer that you might find interesting to use. If the software application is hyperlinked, it will take you to some digital resources that will help you learn how to use the software application better. iCivics - This site has some great simulation games simulating different aspects of government and history. It does require that you make an account, including an email address.